Wildlife experts have expressed fears that a friendly bottlenose dolphin that has been swimming off the Kent coast for the past year may have died. Dave, a female dolphin, was recently injured in what is thought to have been a collision with a boat propeller. She has not been seen at Sandgate, near Folkestone, for more than a month since losing part of her tail. Trevor Weeks, of British Divers Marine Life Rescue, said it was also possible she may have moved along the coast. "It's not unusual for solitary social dolphins like Dave to wander off at certain times of the year. "We know that fish are moving around... so it's quite possible Dave has moved with those fish stocks as well," he said. Experts have also suggested that the recent stormy weather off the Kent coast could be to blame for her disappearance. 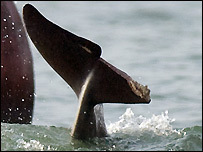 In August, it emerged that Dave had sustained cuts on her dorsal fin, also believed to have been caused by a propeller from a boat.